Where can you stream The Testament of Sister New Devil? On 2015-01-07 Animation/Family TV Series The Testament of Sister New Devil first aired on Tokyo MX. 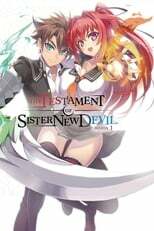 Written and created by Takao Yoshioka & Hisashi Saito, and produced by The Klockworx Co., Ltd. & AT-X, The Testament of Sister New Devil has ended and last broadcasted on 2015-06-29.